An Indian restaurant at the Hotel Strand Continental. Hidden behind the colossal grey frontage of the Hotel Strand Continental is an Indian restaurant quite unlike any other in London. You have to climb past an ancient room sign, and up two rickety flights of stairs, to get to it, from which you’ll step into a casual throwback to colonial times. The walls are mustard, the tables are wipe-clean, and ornate metal lanterns dangle overhead. With roots in the India League, which campaigned for the country’s independence, the Club has been in residence at this address on the Strand since 1946. The room has the kind of old-fashioned proportions that make your heart actually hurt a bit. Nehru, India’s first PM, was a founding member. A portrait of the first Indian to be a British MP, Dadabhai Naoroji, looks down at you while you eat. Thumbing through the pleasantly sticky, laminated menu pages, the first thing you’ll notice is that the India Club is fabulously cheap. Warmly spiced, beautifully light little vegetable samosas were £3. A lovely egg curry, rarely sighted on Brit Indian menus, only £5. There’s a lunch box option that starts at £4.50. This food isn’t going to change anybody’s life: one real low point was the naan bread, which tasted like it came out of a supermarket packet. But the best of it was simple home cooking, served in hearty portions. Try the traditional brinjal (aubergine), and the lamb bhuna, a hunk of tender meat soaked in thick, savoury tomato and onion masala. An intensely thin, crisped-up ghee (clarified butter) dosa also rescued things on the carbs front. 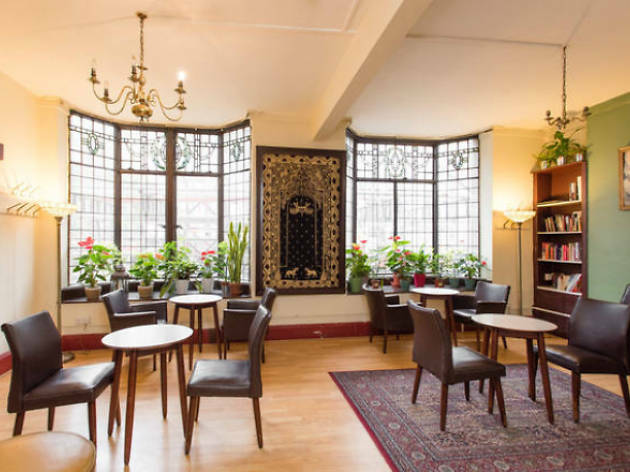 Like most London restaurants that feel as if they’re from another time – like they’re too lovely to still exist this unspoilt, at these prices – the India Club has been under threat from developers. So far, it’s surviving. But go quick, before someone turns it into an oligarch’s luxury flat. I have been loving indian food for 40 years. Touring the UK I have visited a very large number of Indian restaurants and never until now, have I been told that I couldn't have a chapati as it 'took too much time'. The service was appalling, rude and unhelpful. The food was, at best average. I would avoid this dirty old dump and go somewhere they want to serve you decent food, at a reasonable price, because the food here is a rip off. Went here for a friends birthday and had a great time. For £15 we got a range of shared dishes that were tasty and filling. It is also BYOB which was great for the students in the group. I had some trouble finding the entrance which is just a small door along the Strand. The whole building transports you back in time and the bar just below the restaurant was lovely for a drink and chat after dinner. I love this place. The food might be fairly basic (but still very good) and it's all a bit shabby, but it's a pleasing time warp in the modern West End, nestling as it does with a v old-fashioned cheap hotel. The waiters wear old-fashioned whites and they now serve beer and wine (you used to have to go and get it from the hotel bar downstairs). As long as you're not after a classy experience and interested in more unusual London spots, this is recommended. I’ve never really understood the appeal of The India Club. I last ate here just over 3 years ago. I wasn’t overly impressed then and hoped maybe I’d re-evaluate my opinion this time around. Sadly however, the only real ‘improvement’ was the fact that beer is now served in the main restaurant. Even then, when I ordered a pint of Cobra, the waiter suggested I might prefer Kingfisher instead (both were on the menu). This, I realised, may have had something to do with the fact that Kingfisher was the only beer on tap in the restaurant, whereas the Cobra would have meant a trip to the bar downstairs. The food was rather plain and ordinary, nothing to write home about. A bit bland really. Judging by some of the reviews I’ve come across, this place seems to trade largely off its so-called ‘authentic Indian’ credentials. Well, if this truly is authentic Indian, I think I’ll stick to the fake alternative. Since the 1970s I have visited this wonderful restaurant about four times a year. Mosala Dosa with sambal and coconut chutney has in variably been my choice, It is consistently excellent and served with the minimum of delay. One feels removed from the commercial world; there are people reading on their own ;there are happy groups of people who clearly think this place is perfect. Sepia photographs of famous personalities from the sub-continent gaze down at one. The Staff quietly go about their business; there is a site-line through to the kitchen , which gives the certainty that everything is hand crafted. . The staff seem never to get older. I expect the same staff in fifty years. Any-one who cannot afford an annual visit to India should come here. You get the atmosphere of the country ,as soon as you walk in. There is a whiff of Somerset Maugham and E.M Forster about the dining room. Marcel Proust were he alive today would appreciate the soul and feel of the place. 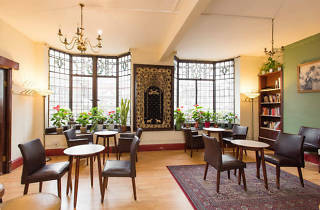 Were I to leave England , there are many places I would miss- amongst them would be the India Club. Had my 28th birthday party here - was fantastic! Food was delicious and such a quirky find - reminds me of what an Indian cafe in Mumbai would be like. All my guests thoroughly enjoyed it and said they'd be back! Been coming here for years - best Indian in town!! Having read very positive reviews of this restaurant about a year ago (autumn 2010) I had been meaning to visit it ever since. The promise of 'authentic' and 'cheap' Indian food in central London sounded wonderful. In December 2011 I was on the Strand looking for an early dinner and so finally made my visit. I could not have been more disappointed. The food and overall dining experience were abysmal from start to finish. I would not have cared about the poor décor and rude service if the food had been as excellent as promised. However, it was truly disgusting. I ate better curries in my school dining room as a child. I have travelled extensively in India and have never eaten food this terrible anywhere in India, not even in the cheapest, grimiest eateries. We ordered a lamb curry (I forget which) - the meat was overcooked, the curry lukewarm, the sauce a tasteless brown gloup; a portion of rice (which we had to ask for several times) - overcooked, possibly reheated, low quality rice; a mushroom dish - tinned mushrooms in the a similar, or possibly the same, brown gloupy sauce as the lamb; a plain naan - not freshly made but out of a packet and barely heated; a paratha - stodgy and heavy not light a layered; a masala dosa - probably the best thing we ate but the dosa was a bit soggy and the filling mediocre, the coconut sambar was luminous green and not very good; finally we had a sweet lassi - neither sweet nor drinkable. The service was rude and inattentive and when we came to pay they kept pointing out that service was not included. The food is not particularly cheap and there are far better Indian restaurants in London for a similar price. But to be honest even if they were giving away this food I would not chose to eat here again. After our visit I checked some more recent reviews of the restaurant several of which said that the restaurant has recently changed hands and has since gone downhill. A shame, but please do not fall into the same trap I did based upon older reviews. The restaurant is terrible. AVOID!